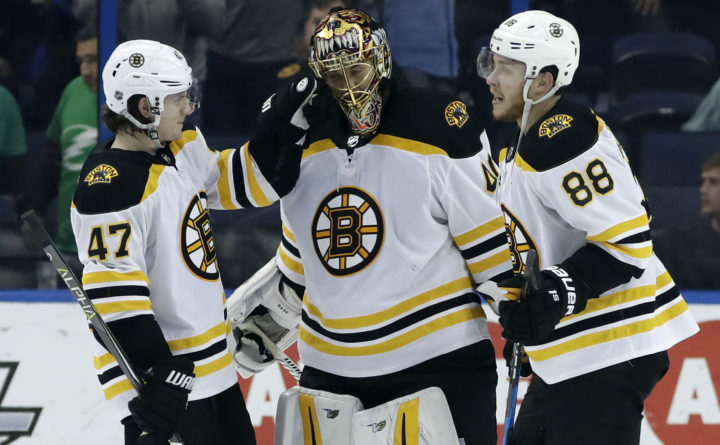 TAMPA, Fla. — Tuukka Rask and the stubborn Boston Bruins stymied the Tampa Bay Lightning — and got even closer in the standings. It was Rask’s third shutout of the season and 41st of his career. It was also the first time the Lightning failed to score a goal since a 4-0 loss at Boston on April 4, 2017 — also against Rask. David Pastrnak, David Backes and Riley Nash all scored for Boston, which moved within two points of the Lightning for the top spot in the Eastern Conference with one game in hand. Torey Krug assisted on all three of the Bruins’ goals. UP NEXT: Lightning: Host Edmonton Oilers on Sunday. Bruins: Host Columbus Blue Jackets on Monday.